I don’t release date-purchase games often these days, but I make exceptions for games like Mario Kart 8. I’ve only played through 50cc, partway through 100cc (I get neurotic about the order I play the cups in) and a couple rounds of the multiplayer battle mode. First off, the graphics are great. Nintendo Polish + HD = WOOPWOOP. Single player is good; pretty standard fare. The multiplayer is a bit of a disappointment. Basically, they switched from battle mode-exclusive sandbox stages to simply using a few of the more condensed race tracks. Even for a stage like Moo Moo Farm, if you’re not going crazy head-to-head and ending the battle quickly, you’ll almost inevitably lose your opponent and drive aimlessly searching until the time runs out. Just in my experience, anyway. Either way, NOT fun. Here’s hoping a free DLC is somewhere down the pipeline. But they rebalanced the game overall to better reward skilled players (hellooooo, Super Horn~) and I don’t spend much time in multiplayer anyway, so I’m pretty satisfied. Worst case: I got Pikmin 3 for free. Things from the gaming channel! 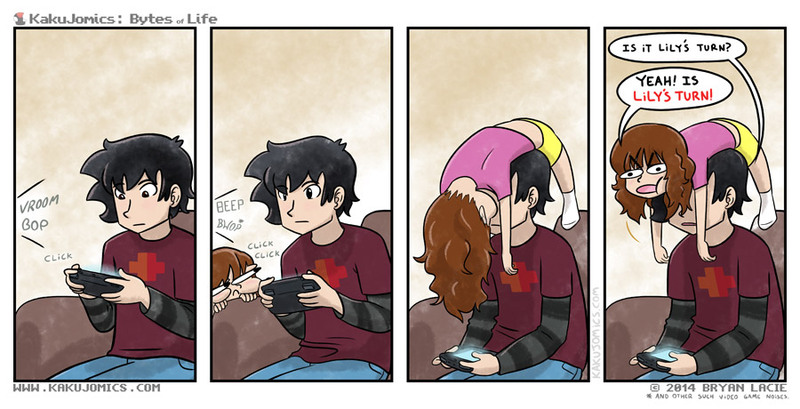 The only problem with raising a child with video games. As the young Lily matures, her instincts begin to flourish in her day-to-day activities. While it may seem like play to most, these games are essential for the growth and development of the Lily. A young, growing, Lily will often mimic things around her surroundings. And in this instance, it’s a cat. The Lily’s father, the Kakujo, has no other option than to let the Lily win. These tiny victories are key to turning her into a capable killing machine. I love as many as four tens of this and that’s awesome. Half the time I have to give them my 3DS or my iPhone just so I can play video games on the computer undisturbed. (I have two 8-year-old younger brothers.) It’s amazing how they can stand there for hours on end watching you over your shoulder even when you have headphones on. Also, Lily’s face in the 2nd panel.